A variant of O'BOYLE, from the Irish Ó BAOGHILL. Of uncertain derivation, but the Boyle last name is considered by most to be connected to the Irish geall, meaning "pledge" or "vain pledge," or thought to mean "having profitable pledges." The O'Boyles were chieftains in Donegal, ruling west Ulster with the O'Donnells and the O'Doughertys. Boyles can also be found in Kildare and Offaly. 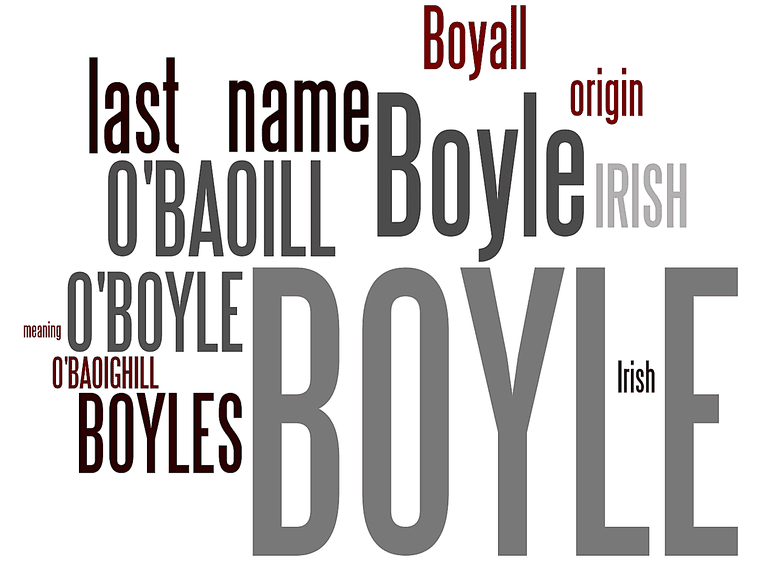 BOYLE is one of 50 common Irish surnames of modern Ireland, as well as the 84th most popular last name in Scotland. Clan Boyle in Scotland originated with Anglo-Norman knights bearing the de Beauville or, more commonly, de Boyville name from Beauville, near Caen. They are believed to have arrived in Scotland after the Norman conquest of England in 1066. There is a record of a David de Boivil witnessing a charter as early as 1164. Originally, the name was confined to the south-west of Scotland where it was pronounced "bowl." The surname spelling also changed over time, with the shortened variant Boyll appearing in 1367 and Boyle in 1482. The land surrounding Kelburn Castle in Ayrshire has been the home of Clan Boyle since the 13th century, and is currently occupied by the 10th Earl of Glasgow, Patrick Robin Archibald Boyle. The Boyle clan motto is Dominus provedebit which means "God will provide." A branch of the Boyles from Kelburn became established in Ireland and eventually became the Earls of Cork. Richard Boyle (1566–1643), the 1st Earl of Cork, was Lord Treasurer of the Kingdom of Ireland. This free project uses results from Y-DNA testing to map individuals with the Boyle surname into different branches of the Boyle family tree. Joining the project entitles you to a discount on DNA testing. Trace the geography and history of the Boyle last name through this free online database based on a University College London (UCL) project investigating the distribution of surnames in Great Britain, both current and historic. Search this popular genealogy forum for the Boyle last name to find others who might be researching your ancestors, or post your own Boyle surname query. The free FamilySearch website features over 1.3 million results for the Boyle last name, including historical records, queries, and lineage-linked family trees. RootsWeb hosts several free mailing lists for researchers of the Boyle surname. Explore links to databases and genealogical resources for the Boyle last name.